A plethora of self-gratifying, insulting, funny, disturbing, or just flat-out eye-brow raising sprays are now live on NextLevelGamer! Sprays for Counter Strike Source, Team Fortress 2, Left 4 Dead, Day of Defeat and more! You can check out our new Source Sprays section by heading this way, or read below for adding/removal instructions. This is quite a painless and easy process. Simply place your downloaded sprays into whatever folder you wish (I prefer mine in a nice neutral folder at the base of my Valve directory for easy access by all Source games). Then boot up your game, select Options, head to the Multiplayer tab, and click on the Import Spray... button. Then just head to whatever folder you have your sprays stashed in, select your new spray, then click Open. Select OK when back to the Multiplayer tab, and you're good to go! 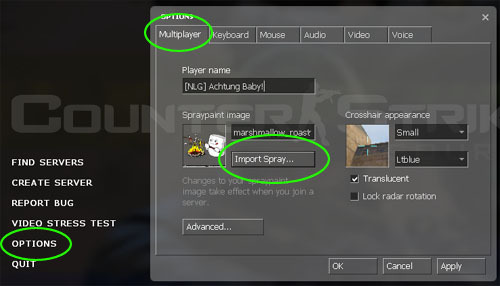 To select a spray that has been already loaded in this fashion, simply click on the named window directly above the Import Spray button and select it from the list therein. Easy as pie. Then delete the spray's .vmt and .vmf files in that folder. Then go into the UI folder in the same directory, and delete the spray's other .vmt and you're done. 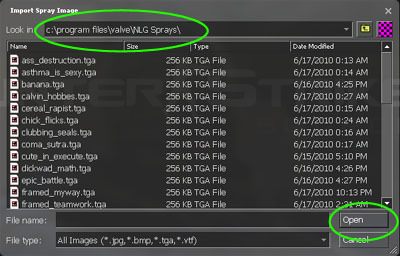 Then enter the custom folder, and delete the spray's .vmt and .vmf files. Then go back to logos and enter the UI directory. In there, delete the .vmt and it'll be wiped away. Some games have different layouts for their sprays, but the basics are pretty much covered under the directory styles above.